Malta is a picturesque island country in the Mediterranean, and it is a member of the EU and the Schengen zone. Its rich history, high standard of living and excellent air links make it an attractive place to live or own a second home. Since the Maltese passport grants you the right to live, study, work and own land anywhere in the EU, as well as visa-free travel to an outstanding number of countries, the citizenship-by-investment program of Malta is excellent value for money. The application process is efficient and strict, ensuring a select group of new citizens. Naturally, close family members can be included in the citizenship application. Your financially dependent close family members can be included in your citizenship application for additional cost. This includes your spouse, all children under 18 (also from previous marriages), unmarried dependent children between 18 and 26, and dependent parents or grandparents (either yours or your spouse’s). To apply for citizenship, you and the family members included in your application must have resident status for at least 12 months immediately preceding the citizenship application. Note that this does not mean a physical residence requirement, only the existence of a residence permit. Furthermore, you must commit to maintaining a residential property in Malta for at least 5 years, invest in government-approved financial assets and make a non-refundable contribution. Once you have passed the diligence checks, you receive Maltese citizenship for life, which can be passed on to your descendants born afterwards. With a Maltese passport, you and your family members can live, study, work and own land anywhere in the EU. Moreover, you will have access to visa-free travel to over 150 countries including the EU, the UK, Australia, Canada and the USA. 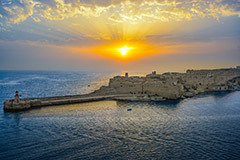 Malta’s membership in the Schengen zone also means you will be able to travel without passport controls within the zone. Citizenship through investment in Malta requires three transactions. First, you have to invest EUR 150,000 in government-approved projects, and maintain the investment for at least 5 years. Second, you have to pay a non-refundable contribution of EUR 650,000 to the National Development Fund. Finally, you have to buy or rent property on Malta for a period of at least 5 years. If you decide to buy, you have to purchase real estate for at least EUR 350,000. Alternatively, you can lease a property for at least EUR 16,000 per annum. Additional fees include a due diligence fee of EUR 7,500, and government fees starting from EUR 78,000. Please note that the fees and limits above are for single applicants, and they may vary depending on the age and number of family members included in the application. Contact us for an exact quote tailored to your situation.